Curb appeal is important not least for adding extra value to your home, but also for giving off the right impression to your neighbors. Your home is an extension of yourself, and if it’s shabby and rundown, people are going to assume the same about you. First impressions matter, science tells us that, and once they are formed, it’s relatively hard to change them. Create an amazing first impression by using beautiful fencing to enhance your home, to border the house and to add the extra ‘wow’ factor that makes potential homebuyers giddy. If the house is set back from the street at all, you are in desperate need of a fence. Looking from the street your home is incredibly far away and seeing a continuous section of turf with nothing else is rather unappealing. Breaking up this visual landscape by adding an extra dimension, as well as some height, is a fantastic way to make your house feel at home in the landscape, rather than it sticking out like a sore thumb. In the front yard, the optimal type of fencing would be wrought iron or gapped vinyl fence, both of which allow plenty of light through while looking chic and professional. Keeping this fencing short makes your house more appealing, while any excessive height can feel restrictive more than protective. Most home buyers are looking for a house that feels comfortable and relaxing, which is why we recommend using a light color, or if you use black only using it on non-opaque fencing like wrought iron. If the fencing creeps along the boundary of your property, it can provide a great visualization of the entire property. Not only is this helpful for potential homebuyers who are getting a first impression, but it also creates a sense of ownership and pride the will make your neighbors jealous. As long as the fencing isn’t high all of the ways around, which could feel oppressive and secretive, a short fence looks tremendous and typically can add value to the sale price. As we mentioned before, your home is an extension of yourself. A clean, modern and cared for fence is a rarity these days, which is why it stands out so much. When people see this, they recognize that you care about appearances, and by extension, you must care about your home and family. Well maintained yards and fencing are less frequent than they were decades ago, we are all overworked, which is why it can be such a difference maker in your curb appeal. In the 60’s a gorgeous fence was standard, but now it makes you the fanciest home on the block. Fortunately, our wrought iron and vinyl fences are easy to care for. They require practically no maintenance of any kind and washing them periodically just a power washer is plenty to keep the dirt and debris away. All of our metal fences are treated with a specialized powder that prevents them from rusting and keeps them looking great even years after we install it. In the age of social media, we are all looking for a little privacy. While a privacy fence is less desirable at the front of the home, along with the sides and at the rear, it can add plenty of curb appeal. Potential homebuyers and nosy neighbors are going to be filled with jealousy when they see a sparkling new 6-foot privacy fence along the rear of your home. Our most private fences are made of vinyl, which is an opaque material that keeps out prying eyes and allows your family to enjoy the backyard in peace and safety. Fencing is the perfect border to any greenery. 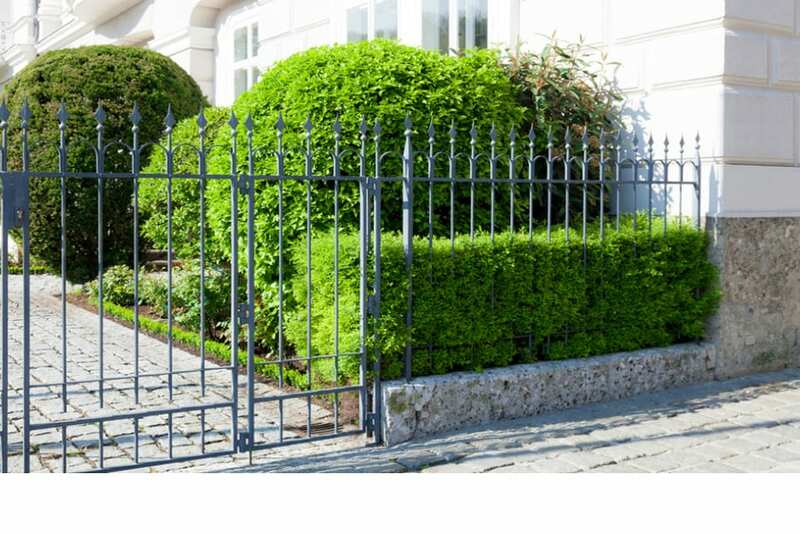 It’s difficult to create a precise border with only soil, but lining the greenery in your front lawn with a new wrought iron fence is undoubtedly a breathtaking feature which is often used by professional landscapers. Fortunately, this isn’t hard to replicate. We can install short fences along the property line, and also use them to border your plantations and flower beds to create a professional and chic aesthetic.